Kitty Flame: Highway Warrior was developed during Game Hive's first game jam. Developed by a team of 4 in a week's time, Kitty Flame is an engaging arcade experience for Android devices. Take control of Kitty Flame, the renegade cat with the cool convertible. Fight against the evil gang of canine thugs, the Woofs. Be careful, they’re bringing all they’ve got. Motorcycles, trucks, ATVs, and even tanks! Upgrade your ride with kickin’ rad weapons to show the Woofs you’re no scaredy cat. Can you get the high score and be the ultimate Highway Warrior? What are you waiting for? 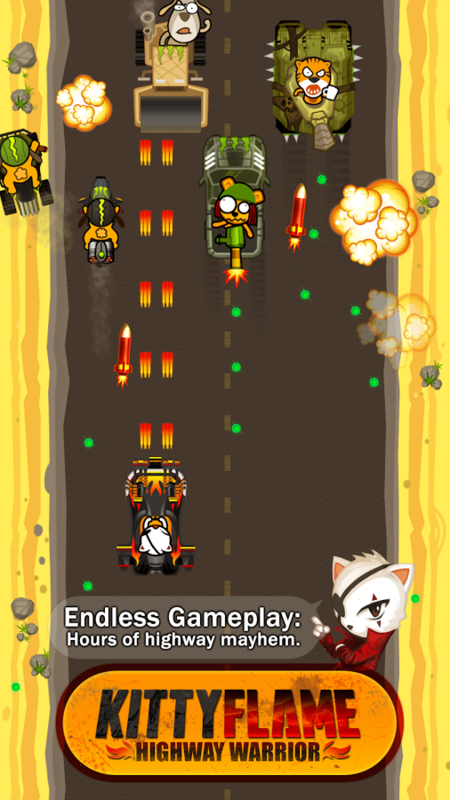 Download Kitty Flame: Highway Warrior right meow and let the carnage begin!